Central Brisbane. 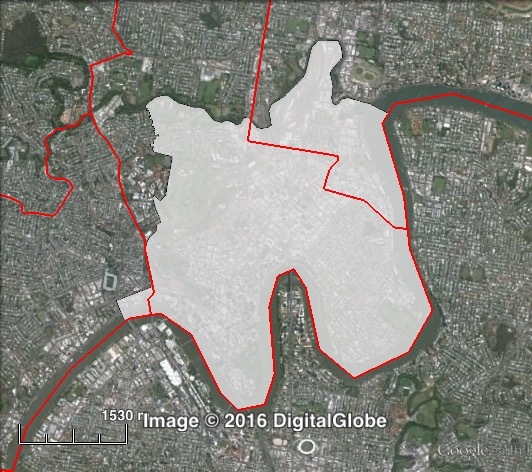 The Central ward covers the Brisbane CBD along with the suburbs of Spring Hill, New Farm, Newstead and Fortitude Valley. Map of Central’s 2012 and 2016 boundaries. 2012 boundaries marked as red lines, 2016 boundaries marked as white area. Click to enlarge. 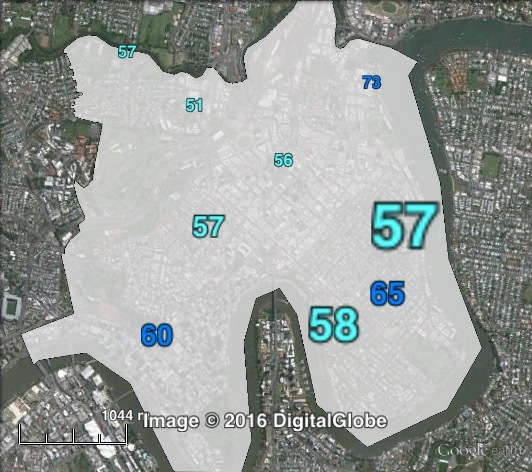 Central ward gained the remainder of Bowen Hills and Newstead from Hamilton and lost the remainder of Grange, Newmarket and Wilston to Enoggera, and the remainder of Kelvin Grove to Paddington. These changes increased the LNP council margin from 8.7% to 9.4%, and the mayoral margin from 16.7% to 16.9%. Labor’s David Hinchliffe won Central ward in 1988. For most of his tenure, Central was considered a safe Labor seat. In 2000 he polled over 63% of the primary vote, and after that election the Labor vote began to collapse. In 2004, Hinchliffe suffered a 15.6% swing, with a swing of over 17% to the Greens. Hinchliffe held on with a 12% margin. The 2008 changes significantly weakened Labor, with their 12% margin falling to only 8.4%. At the subsequent election, Hinchliffe only managed to win by 102 votes, or a 0.3% margin. David Hinchliffe retired in 2012, and Labor’s candidate selection was a mess. The original candidate Paul Crowther was replaced by Grace Grace after she lost her overlapping state seat at the 2012 state election. The Electoral Commission ruled that state election candidates could not stand in the local government election due to the overlapping timetable, and thus Grace was replaced by Heather Beattie, wife of the former Premier. Beattie lost to LNP candidate Vicki Howard with an 8.9% swing – a combined swing of 17% over two elections. On a primary vote, the Labor vote in Central dropped from 63.4% in 2000 to 30.5% in 2012. Central was traditionally very safe for the ALP, but a combined swing of 17% to the LNP over the last two elections, along with a sizeable part of the Greens vote exhausting, has given the LNP a sizeable margin. Considering the ward’s history, Labor would be hoping to win back Central. 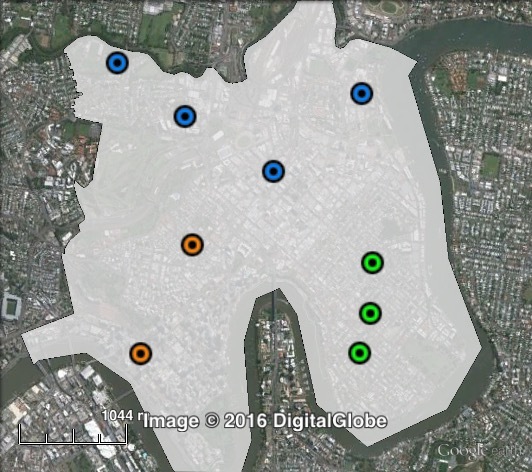 Polling places in Central at the 2012 Brisbane City Council election. East in green, North in blue, West in orange. Click to enlarge. The Liberal National Party’s two-party-preferred vote in the council election is only about 55% in the west, but is 65-67% in the east and north. The Greens came third, with a vote ranging from 17.4% in the north to 19.7% in the west. Two-party-preferred votes for councillor in Central at the 2012 Brisbane City Council election. Greens primary votes for councillor in Central at the 2012 Brisbane City Council election.